Eight years after buying the Wharram plans for Magayon II, we finally went to Talisay on Friday, December 12, 2014 to launch Magayon II. The Typhoon hitting the Philippined during the previosu weekend had passed without too much damage and the weather report looked favourable, with a low pressure area on the Pacific but very far away. On the way to Talisay we tried to buy a deep cycle battery for the boat's electrical system, but could not find one in a size that would fit. 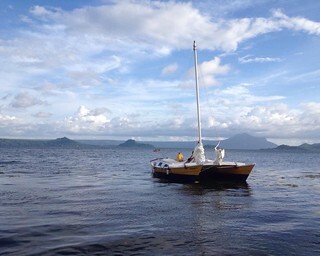 Martin and Miriam then spent Friday in Talisay to fix last minute things and to completely assemble the boat. 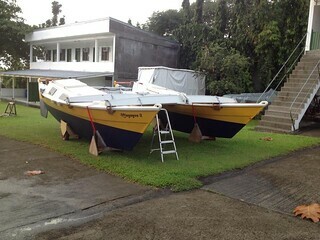 On Friday evening Miriam and Martin had also already pushed Magayon II out of the boat shed and rested her on the gass (left) to clean up the boat shed and to throw all the junk that had accumulated during the buidling period. The next morning, before the crowd arrived in the resort, we pushed her down to the shore (right). The mast was settled on the cockpit and tied with a securing rope to the mastfoot (above). One stay at each were then prepared and lashed temporarily to the lashing pads and secured and held in place (below left). 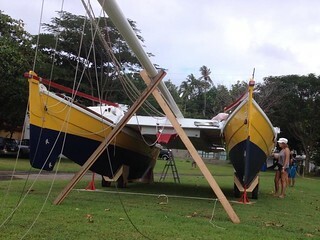 The second stay of each side was then used to secure the mast in upright position while it was raised (above right). Raising the mast turned out a bit of a challenge because it is very heavy. The Wharram plans show only two people raising the mast, but that profed impossible. 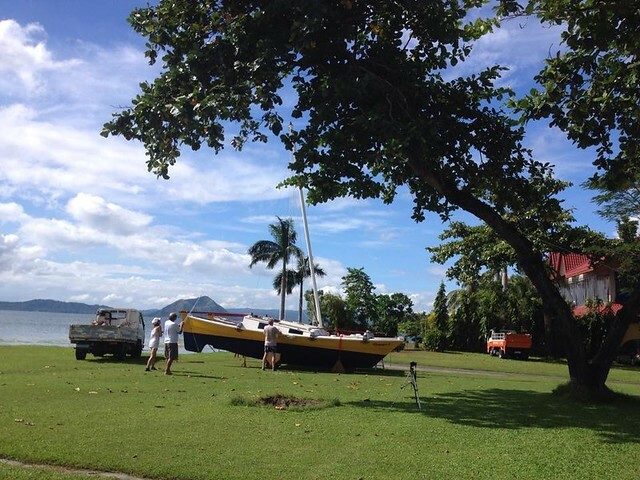 Walter got his small tractor and attached the forestay with a long rope to it. Walter drove his truck underneath the mast top and one person climbed on top of the roof of the drivers cabin to lift the mastend as high as possibe. Two guys stood in the cockpit and helped lifting the mast from there. Then Walter pulled it up by reversing with the tractor. 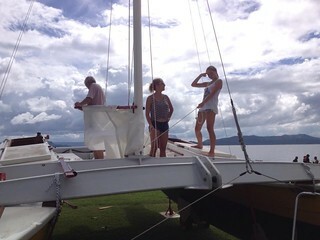 While Miriam, Kata and Peter secured the mast in upright position (above) we tightened the stays at the side and fixed the right angle of the mast. We then pulled down the forstay on the rope attached to it and lashed it to the metal wire connecting both bows. 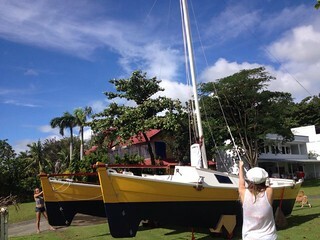 At this point the mast was secured in upright position and we attached the second stay on each side to their lashing pads. Finally the mast stood (below). 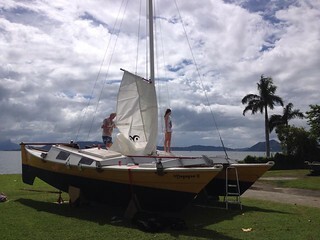 The next thing was to fit the sails and to make the sheets (below). For some reason the planning of shopping components had worked nicely and all parts needed were there, and all the lines were of sufficient length. 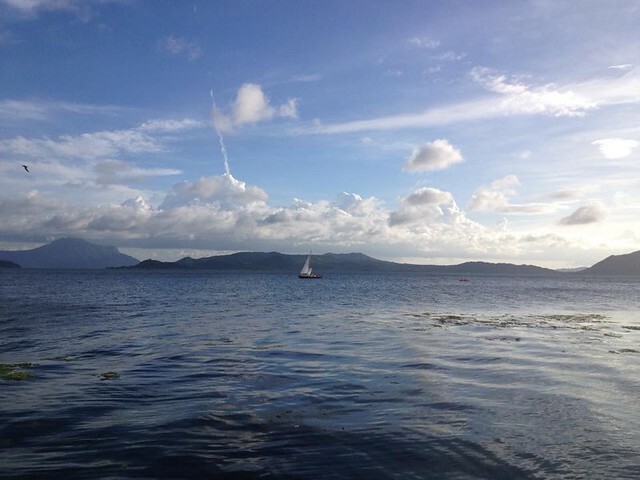 We completed both sails and successfully tested rasing them (below). What we did forget to make was reef lines, which led to aborting raising the main sale later on the lake because the wind was too strong. 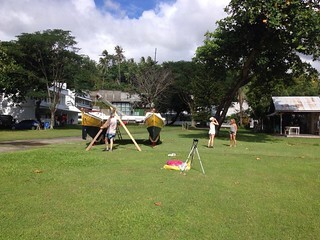 A whole bunch of people helped launching Magayon II on Saturday afternoon (below): Walter, Peter, a whole group of volunteer rescue workers who had come to the resort to try out their new outboard motor, a donation from abroad. And then, finally she was in the water and afloat (below). Everything had gone surprisingly smooth. 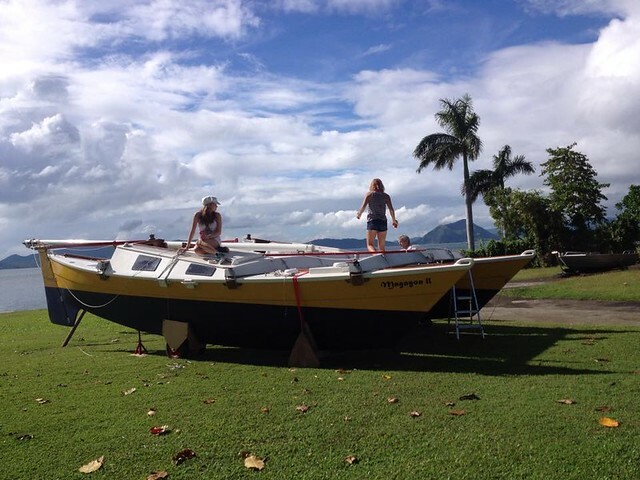 We (Martin, Miriam and Kata) had some problems to get her through the thick see weeds, it immeditely wrapped around the outboard motor propeller and rendered it ineffective. We used the canoe paddles and raised the gib and finally got her free. We spend around two hours on the water testing the sails but due to strong wind and the absence of reef lines could not use the main for very long. The question was then how to moor her for the night. 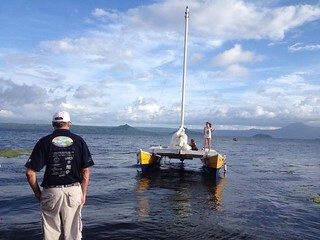 We first considered to use a mooring of Taal Lake Yacht Club but it is very close to the shore with lots of seeweed around it. So we just decided to achor, went back to the shore at fetched the anchor, 15m of anchor chain and a 30m anchor rope. Anchoring at 8m depth went surprisingly well and with around 25m line out the anchor dug in nicely. We got a lift to the shore from the very friendly rescue team who picked us up with their rescue boat. 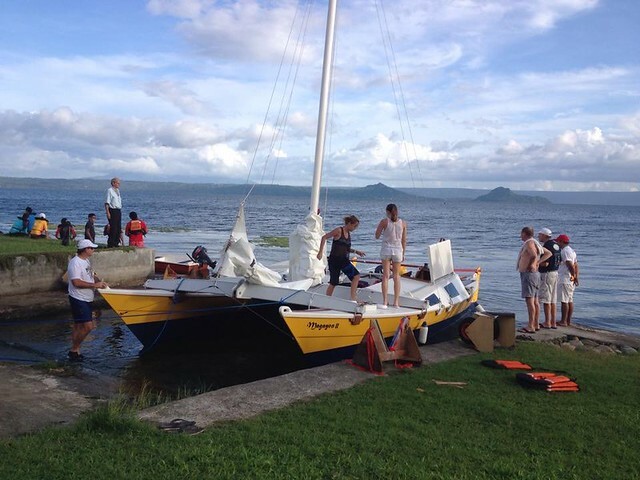 Martin and Miriam went to the Chrismas Party of Peter at Taal Yacht Club for a beer in the evening and then took the Optimist Lemony to paddle back to Magayon II to spend the first night on the boat. On Sunday we took her out again, this time Mavic joined. 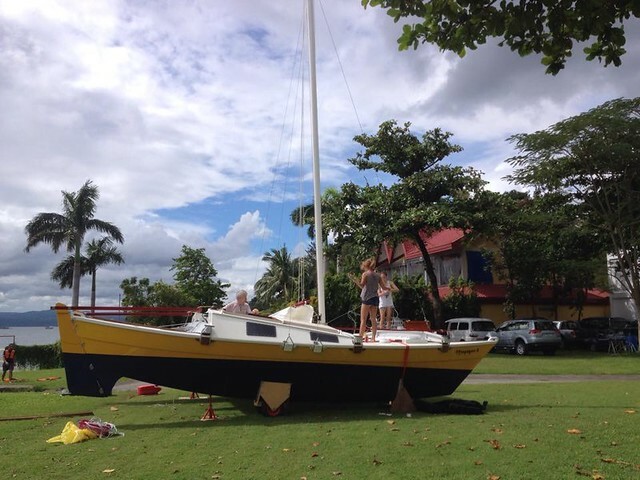 The wind had become even stronger but she proofed being very seaworthy and stable. Breakage of a small part that holds the cockpit down when a big wave hit the cockpit bottom finished the day and we had the extremely helpful crowd of sailers and windsurfers at Walter's resort help us pulling Magayon II out of the water, where we left her to pick her up on the next Friday for the Christmas trip. All in all a very successful launch with almost everyting working out well (I wanted to write accoring to plan, but there was actually not really a plan). Last note before leaving for Christmas. 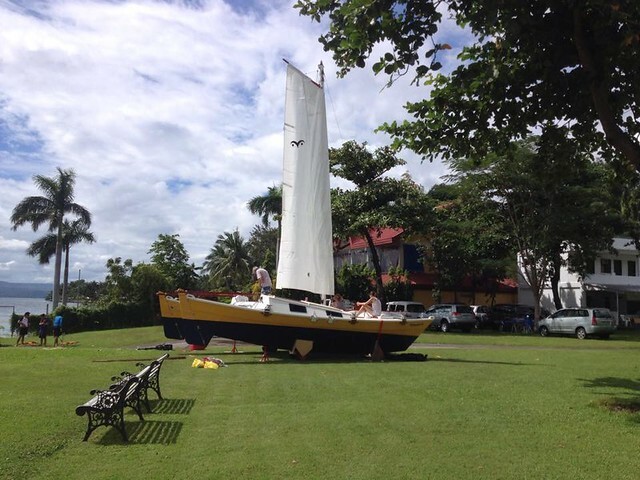 Unfortunately we could not push through with the plan to sail to Pandan Island this holiday season. The only thing Martin had not tested, the tow hook of the trailer, went wrong. The attachment at the trailer is from Europe, the ball at the tow bar is from the US in inches.It is 0.5 mm too thick, so we could hot attach the trailer. Mars Climate Orbiter Flashback. Time was too short for getting a new part, so Plan B applies, leaving for Pandan by car and bringing the three inflatables for some white water rafting on Patrick River. Only the US, Liberia and Myanmar are still using the archaic imperial system, or something like it.